The Providence Bruins take on the Hartford Wolf Pack on Sunday, February 24 at The Dunk. The first 1,000 fans in attendance will receive P-Bruins Mini-Poster #5, the fifth in a six part series, presented by Sullivan Tire. Be one of the first 1,000 fans in attendance and receive P-Bruins Mini-Poster #5, the fifth of a six part series of giveaways, presented by Sullivan Tire! 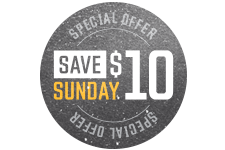 Save big on tickets with Save $10 Sundays! Get $10 off tickets to Sunday home games at The Dunk all season long! Get $10 off tickets for this great Sunday home game at the Dunk!